As published in Products Finishing Magazine, May 2017 issue. Asterion introduces a comprehensive plating system covering demands for productivity, corrosion resistance and appearance. Alkaline zinc plating is often met with a range of requirements including cost, corrosion resistance and aesthetic appeal. 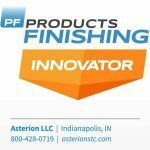 Providing plating processes, pretreatment chemistry and powder coatings to the surface finishing industry, Asterion introduces an integrated system it believes meets those demands, increases productivity and reduces rejects. According to the company, several chemical suppliers have introduced an integrated zinc system approach with varying degrees of success. Although the systems may have worked well in the lab, many were deficient in high-volume production. As a result, surface finishers often revert to “cherry-picking” an alkaline zinc process from Supplier A, a passivate from Supplier B and make a final “coin toss” decision for a sealant. With these challenges in mind, Asterion collaborated directly with customers, gaining knowledge on current and emerging application requirements. The result is the company’s Ultra alkaline zinc system released in April 2017. Read more.